Football season has arrived! Like many boys, I had the dream of one day playing football for the Detroit Lions. I had several gridiron heroes on the Detroit Lions, including Gail Cogdill, Yale Lary, and Pat Studstill. I also enjoyed watching the original Fearsome Foursome who played for the Lions (Sam Williams, Alex Karras, Roger Brown and Darris McCord.) The only Lions game I ever attended was the 1962 Thanksgiving Day when the Fearsome Foursome sacked Bart Starr eleven times. This game is probably still the highlight of the last six decades of Lion futility. 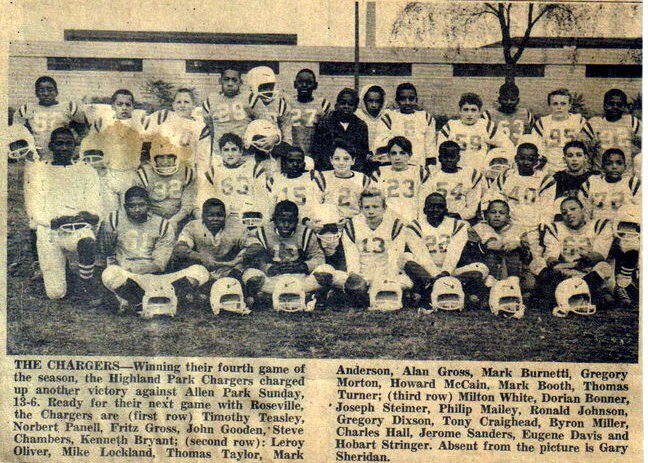 My preparation to enter the NFL began when I was nine years old when my parents paid the four dollars to sign me up for the Highland Park Polar Cubs (later called Chargers). The Polar Cubs consisted of three different teams: Freshmen, Junior Varsity and Varsity. My team would be the Freshmen team. After signing up, I went to the Ford Park locker room and had a physical. This was a brief two-minute check for a hernia and a heart murmur. After the physical, the practice uniforms were distributed. The uniform and padding seemed quite bulky on my skinny nine-year old frame, but if I was to enter the NFL I would have to suffer with this slight inconvenience. Before practice began, my Dad had to go to Epps Sporting Goods and buy my football cleats. These were black high top canvas shoes with rubber cleats on the bottom. They seemed quite harmless, but I am glad that I never experienced having those cleats land upon my body. I also had to buy a tooth guard. I felt like a real pro with this in my mouth. Now that I was equipped to play football, I would soon get into the routine of having practice every afternoon at 4:30 P.M. Happily, the practices were at Ford Field which was a very short walk from my house. I only had to cut through two backyards and there I was at practice. Practice began with calisthenics. I had never done a jumping jack, or a sit up before. The worst part of the practice was the running. We had to run one time around the Ford Field track. Yes, it was only a quarter-mile, but it wasn’t easy for a skinny nine-year old with a ton of equipment on him. Our Freshman coach was Mark Storen Jr. who was the mayor’s son. He seemed like a good coach and cared about each of his players. Unfortunately, I must not have impressed Coach Storen. One day, he had me throw a football several times to see if I was quarterback material. Unfortunately, I failed. A matter of fact before the first game, I discovered that I was a second-string lineman. This meant that I only played one series of downs each half. Once the season started, we played our home games at Ives Field. It was neat to go to other cities to play our away games. This was like the NFL. We played in places like Wyandotte, Garden City, and East Detroit. My parents were my best and probably only fans. They would take me to every game and encourage me in my fledgling football career. As a player for the Highland Park Polar Cubs, we were required to sell twenty-four one pound boxes of Sanders Chocolates, which helped pay for our uniforms. The price was only a dollar. I had never sold anything before. However, many family members bought some, and my Dad took some boxes to work to sell. I also hit up on some of my neighbors. One neighbor, Mr. Walker was always good for two boxes. In my last two years of Little League, we would sell a ten ounce box of Morley Chocolates, instead of the Sanders chocolates. The next year, I would once again go through the same routine, except there was one major snag. When I went to get my physical, I failed. I don’t remember why, but I cried and cried. My NFL career would never materialize. However, Mom and Dad comforted me and took me to our doctor, Dr. Wreggit. He gave me a clean bill of health, and I was back on the team! 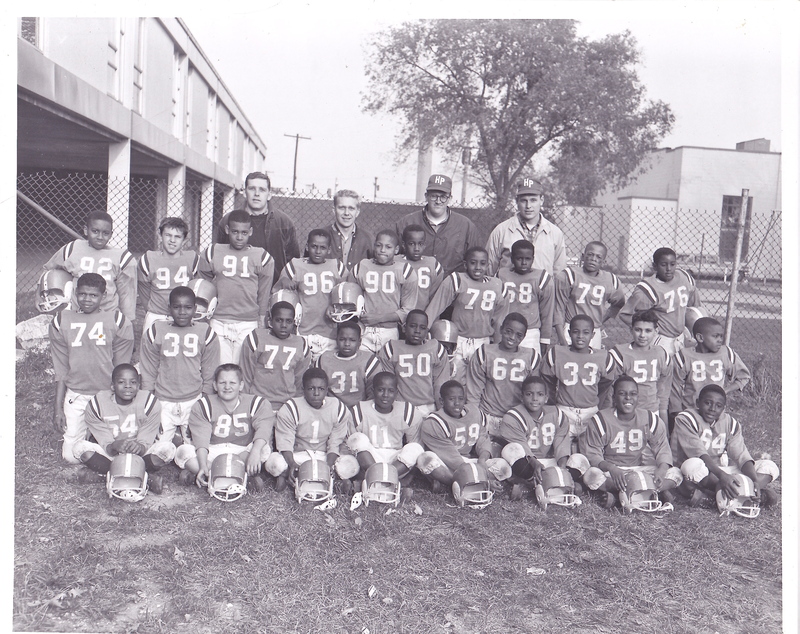 Now, I was on the Junior Varsity team; however once again, I was a second-stringer. I always thought that I was a great football player. Why weren’t they seeing my talent as a wide receiver? Once again I was a lineman, who played sparingly. One day, I was going up and down my street selling the Sanders chocolate. I knocked on a door, and my Junior Varsity coach opened the door. He invited me in and I met his wife. The interesting thing was that he only lived in one room of the house with a very small kitchen. I came away from that experience feeling sorry for Coach Leo. He didn’t have much; yet he sacrificed his time to coach football. 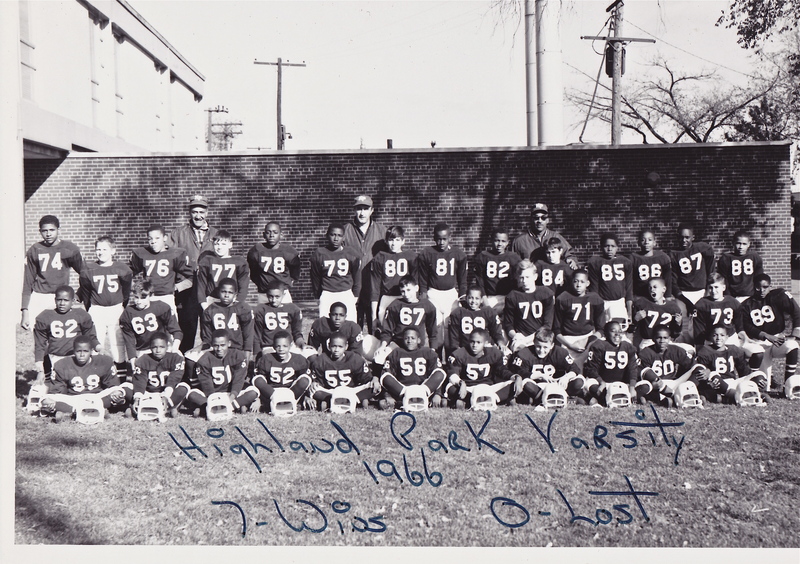 The Highland Park Polar Cubs Junior Varsity Team-1965. I was number 51. My last two years of playing Little League Football were basically a repeat of the first two years. Yes, I was now on the Varsity team. Our uniforms were no longer blue with white trim, but they were maroon. We were no longer the Polar Cubs, but we were the Chargers. For those two years, our team went undefeated. Mr. Dobson, Mr. Williams and Mr. Marone were our coaches. Mr.Dobson was a great head coach even though he never recognized my ability either. He placed me in the safety of the second-string team where I couldn’t do any damage to the team. One highlight of all four years of playing Little League football was the year-end banquet. This was when we each received a trophy for playing on the team. The most exciting part of this banquet was that a Detroit Lion football player would attend. One year, I remember having Ernie Clark sign an autograph for me! Were the four years of practice and playing a little of each game worth it? Yes, I have no regrets about those years. I enjoyed the practices every afternoon. I also remember a couple of games where I actually made a tackle. Also, playing football gave me some discipline in my life. I also learned that I needed to think about another profession. It didn’t look like the NFL was in my future. However, I did learn to something about salesmanship by selling those boxes of chocolates each year.